What if we wanted Ohbot’s eyes to pan left and right quickly to look scared? 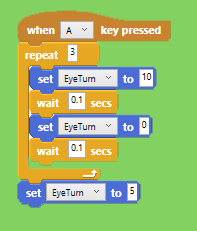 One way would be to create a long sequence of set eyeturn to commands. A more efficient way to achieve the same thing would be to repeat a section of the code.